Orchestral tracks for nearly all emotions that can be shown on a big screen. Perfect for sentimental and reluctant as well as moving and action-packed scenes. Orchestral pop rock dominated by strings, electric guitar, drums with dramatic moments, slow and melancholic at the beginning, hopeful and fast in the middle. Orchestral pop rock dominated by strings, electric guitar and drums. Solo-piano, melancholic, slow, toughtful, loopable sequences. 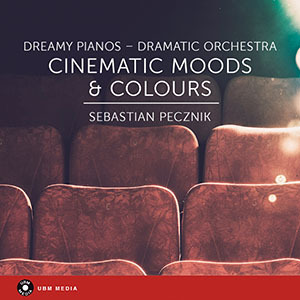 Piano with jazzy motives, slow, dreamy, calm, melancholic, toughtful, background with low choral singing. Beautiful saxophone and a guitar create a positive jazzy mood. Slow-pop, guitar and piano create a melancholic beginning, strings start at 0:55. This slow track works for images of nightlife. Jazzy parts. Dramatic track, solo piano, thoughtful, melancholic, sad, slow in the beginning, becomes faster during the track. Positive pop-groove, relaxed motive, drums, guitar, bass, syntheziser. Positive track, ideal for emotional family portraits. Guitar, drums and keyboard create a positive sound for the weekend. Cello, glockenspiel and accordion remind of a trip to a fun fair. Fast, dynamic track with bass, syntheziser and claps. Jazz meets electronic sound. Piano, bass, drums and trumpets match perfect to an urban scenery of a city at night. Swinging, airy sound, dominated by bass and a dramatic end. Syntheziser creates spheric and dreamy sound. Works for relaxing pictures. Vintage guitar and bass create a dynamic sound. Medium tempo. Epic track, emotional, melancholic. Dramatic drums and wind instruments start in the middle of the track. Sad, melancholic themes change to dynamic themes which remind of marching, armed and dangerous troops.